So it was announced today that there will be auditions to be in two groups (more details to come in late April). • A new audition was announced through the official website on March 30, 2018, to find group members for two new groups; one will feature Ichioka Reina as leader and the other will include Takase Kurumi and Kiyono Momohime as members. • The aim for Ichioka's group is a "performance group" that focuses on singing, dancing, and using various types of physical expression. • Takase and Kiyono's group will be formed with the image of a "small theater troupe" that will incorporate elements of theater and comedy in addition to song and dance. • The groups will begin activities between Summer - Autumn 2018. Some joint activities are planned. • Those that pass may be added to either group. • The audition will differ from previous auditions in it's search. In addition to girls that love singing, dancing, and Hello! Project, they are also seeking girls that have a special skill or talent they feel they can brag about, they're proud to have, that they believe they won't lose with. 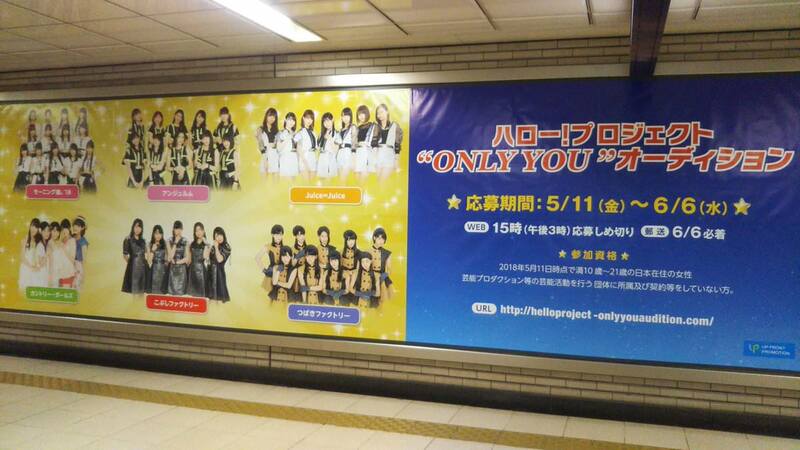 • Final members for the two groups may be chosen from both the audition finalists and the Hello Pro Kenshuusei. Part of me says they can't have no winners. The other part tells me "that's what you thought last time". I do hope they will find new people and don't end up with another glorified KSS audition. Ridiculous that Ichioka’s group was announced nearly a year ago and they’re just now doing auditions. Even more so with how many new kenshuusei we’ve gotten. Yeah we’re already getting one release a year from some groups now, two more (assuming the second will release music consistently) is just gonna make it worse. I feel like Kanemitsu is going to be put into Momo and Kurumi’s group. Really hoping Kokoro and Kanemitsu finally debut. I want Yuhane in Momusu or Anju. I hope at least 2 girls pass this 🙄 One per group. They’ll put Yuhane in the theater group to spite you. I'm hoping they'll debut Inoue Hikaru. She's been there about as long as Rie and Nanami were and she's decently talented. Hikaru doesn’t have the idol aura though, I think she’ll follow the path of Kaneko Rie. I'm very anxious for Kurumi's group, I hope this is a sign of good things to come. I feel like it was announced and then just... totally went by the wayside LOL. No reflection on Hikaru's talent, but that ship has sailed and she's been left behind. It's not gonna happen for her. 1. The rest of the group might be awkwardly younger than her. I bet they won't be allowing anyone past the age of 16 to take part in the general audition and the only Kenshuusei older than her is Horie Kizuki at 19, Inoue Hikaru is close with 17 years. That being said in late summer, when the group will hopefully debut, the two will be 20 and 18 respectively. But they will never make a group out of only 3 members for H!P (at least not atm). Considering they want this one to be the "performance group" I can see them adding older members to give it a kind of K-Pop feel. However, as said, I doubt they'll allow anyone older than 16 in the audition - and they'll probably add a 12 year old just to spite me. 2. When Yuuko and Kei joined they did not really join an idol group, in fact Yuuko didn't audition to join any girl group lol. That being said, back then being in MM - or H!P - was a job with somewhat of a future. It was the door to entertainment business. Nowadays H!P is irrelevant and I mean, they don't even do talento stuff anymore. They perform on stage, both concerts and stage plays, like 98% of the time. Being an idol doesn't really work as a first step into a whole big industry and most of those who are still with Up Front post graduation have made enough money during their active time or are close to getting married or anything. What I'm saying is Ichioka hasn't had a real job yet, there have been no news about her going to university, and "idol" is an insecure job especially if you start that late. I worry that she might simply say bye bye after a year or two because your early twenties are a really weird time and you have to make a lot of decisions for your future. You're constantly under the mood that you're losing time if you don't do something that secures your future. It's totally possible to work with Up Front after you reached 25 years of age, but I'm not sure if that's a good job. I'd say people like Takahashi Ai, Michishige Sayumi or even the Kids have made enough money in their life not to care too much about smaller jobs. I guess the biggest things you can do are stage plays, but considering that Ichioka has only played side roles that's not something that's open for her yet. Becoming a model is also pretty much out; even active members rarely get good photoshootings. Hell, considering her popularity you would guess Sayumi would've gotten more modeling jobs but I only remember that one where she wore office fashion or something. Writing books... on what? Dawa has art, Ai had fashion, Ichioka is a nobody, nobody would buy her book aside from maybe wota. I mean being in H!P you do have some kind of salary but it definitely isn't much if you don't have side stuff like photobooks or single TV appearances or photoshoots. I honestly can't see her going post 25, and then what? Ichioka is guaranteed to debut and has got a good five years, which is a nice tenure. That she’s still around and as far as I know, not in college, means she’s not worried about future opportunities. Most of these girls come from families with money, probably. Look at all the girls in their 20s doing absolutely nothing in other groups. Everyone knows idol groups aren’t making stars anymore. I’d be more worried about girls like Horie who aren’t getting another chance. I mean yes, probably, but it still is weird. She's been in a limbo for a whole year doing, well, nothing. Out of school, no university, just doing a few vids for YT and performing a few times. She might have five years but eh. This feels like nothing nowadays since they do basically nothing. As long as she does debut, H!P is a golden ticket. Five years may not sound like much when you look at people who stuck around for ages like Takahashi or Sayu, but H!P girls are among the most highly paid in the entire idol industry and five years of photobooks, touring, etc is likely to set her up with a pretty penny. H!P's not a stepping stone into a showbiz career (never has been), but it is a pretty sure bet to a comfortable life if you play your cards right - you can be a millionaire in just a couple years. It's also very possible Kurumi is just training behind the scenes during this lag since the group is meant to be performance focused. Perhaps they want someone to take C-ute's place as a group that can sing and dance incredibly well. If so, it would make sense to boot camp the girls they already have while they look for the missing pieces. I don't feel like she's sitting around doing nothing (although even if she is, some people are fine with that LOL). I just hope they debut soon because I'm getting impatient! I want some new blood out here. She’s basically still a trainee isn’t she? That’s really all they do. But well, rereading your (Anderei's and Farrah's) comments it's probably still a good job after all. Personally I wouldn't be too happy with it, but that's her decision after all. 21! Alright, hopes for the older ones to get into Ichioka's group. It's not much but I just posted to say their advertisements look like stuff straight out of 2006 lol. Are you hyped for the two new groups? Well here are the KSS that will join! I guess it was a given for Yuhane to debut and I'm glad to see Kokoro here. Guess now we know why Inoue Hikaru left and we can probably say goodbye to Horie Kizuki soon. The audition's 1st deadline ended on the 6th for non KSS girls. I'm figuring, they get the KSS girls out first and if they find any other girls in this audition that can play well with others or looks like they can fit into the mold they are trying to make. Maybe it's easier in the process? OR they want to get them somewhat ready for the summer concert. OR this is UF and they like to play with their own rules and anything can happen. I'm so happy for Yuhane and Minami! These girls all sound promising for debut. Damn, I totally forgot about Ichioka getting a group. I don't follow KSS I have no opinion on these choices, but I am interested in their debut. Is there an official news source for this? Really happy for Yuhane and Kokoro! Also I like Eguchi Saya for an obvious reason so yay for her too!